Information on Aspettati (in English) is scarce, but a handful of auction records include nothing quite like this small Impressionist, borderline Symbolist work in a palate of melancholic secondary colors against a manic blue sky. A lone woman muses in a scruffy park. Two stone pines—also known as umbrella or parasol pines, a tree characteristic of the Mediterranean—divide the composition into what is nearly a Golden Section proportion. All is ennui. Karl Wassermann received this work in trade—source unknown—for one of his own paintings. 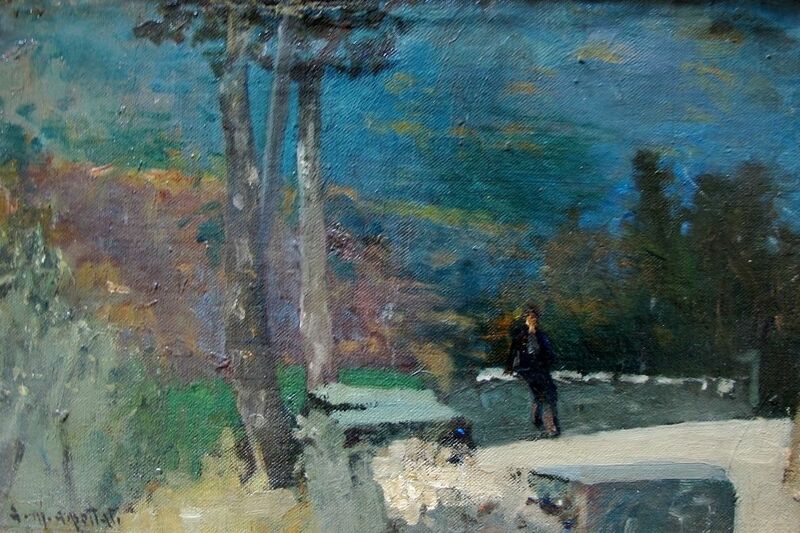 “Woman in a Park” was bequeathed to the Community Collection on Wasserman’s death in 1972. By agincourtiowa in Landscapes & Livestock on Friday/02/May/2014 .